The All-New 2019 Ford Ranger Offers Class-Leading Power, Towing, and Fuel Economy. What More Could You Want From a Midsize Truck. Ford Ranger makes a triumphant return for 2019 – a midsize pickup truck engineered Built Ford Tough, ready for adventure and packed with driver-assist technologies to enable easier driving both on- and off-road. Anchored by a high-strength steel frame, the 2019 Ford Ranger is available in either SuperCab or SuperCrew configurations, as well as 4x2 or 4x4. The 2019 Ford Ranger models come in three trim levels – XL, XLT and Lariat. Chrome and Sport Appearance Packages are also available. Ford Ranger’s standard 270 horsepower, all-aluminum turbocharged DOHC 2.3-liter EcoBoost engine produces 310 lb.-ft. of torque, delivering the most torque of any gasoline-fueled engine in the midsize pickup segment. Paired with a class-exclusive 10-speed transmission, Ranger boasts a unique combination of efficiency, power and capability. Ranger trucks short overhangs provide better approach and departure angles off-road. And an available FX4 Off-Road Package features off-road-tuned suspension, all-terrain tires, frame-mounted heavy-gauge steel front bash plate and skid plates, rear locking differential, two-speed transfer case, innovative Terrain Management System with four distinct drive modes and Trail Control. When configured as a 4x4, Ranger returns EPA-estimated fuel economy ratings of up to 20 mpg city, 24 mpg highway and 22 mpg combined. * This is the best-in-class EPA-estimated city fuel economy rating of any gasoline-powered four-wheel-drive midsize pickup and it is an unsurpassed EPA-estimated combined fuel economy rating. Technology comes built-in, starting with an 8-inch touch screen for available SYNC 3, with Apple Car Play and Android Auto connectivity. A single or dual LCD productivity screen is available for real-time vehicle, navigation and audio information, including trailer monitoring. Ranger has standard Pre-Collision Assist with Automatic Emergency Braking. A Lane-Keeping System that includes lane-keeping assist, lane-departure warning, reverse sensing and class-exclusive Blind Spot Information System with trailer coverage is standard on XLT and Lariat. Adaptive Cruise Control is standard on Lariat. 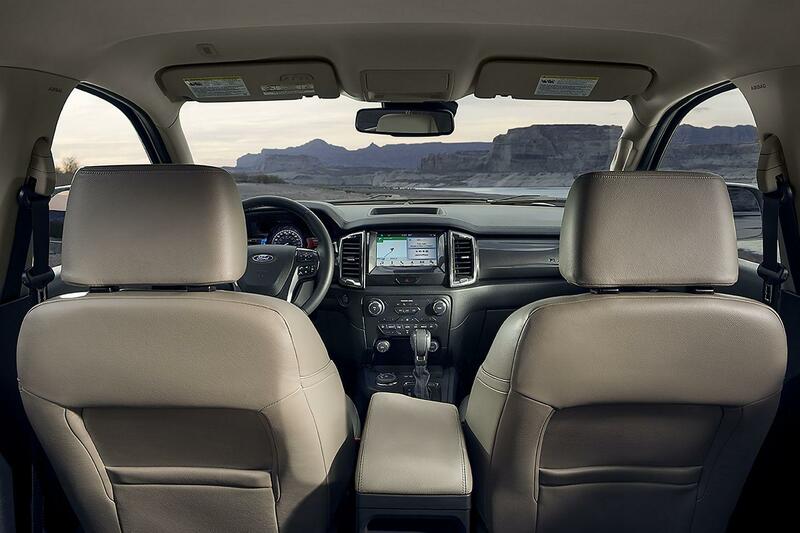 With the most powerful engine in its class, even compared to competitors that offer a V6 engine, exceptional fuel economy, and massive towing capabilities, the 2019 Ford Ranger should be on your shopping list. 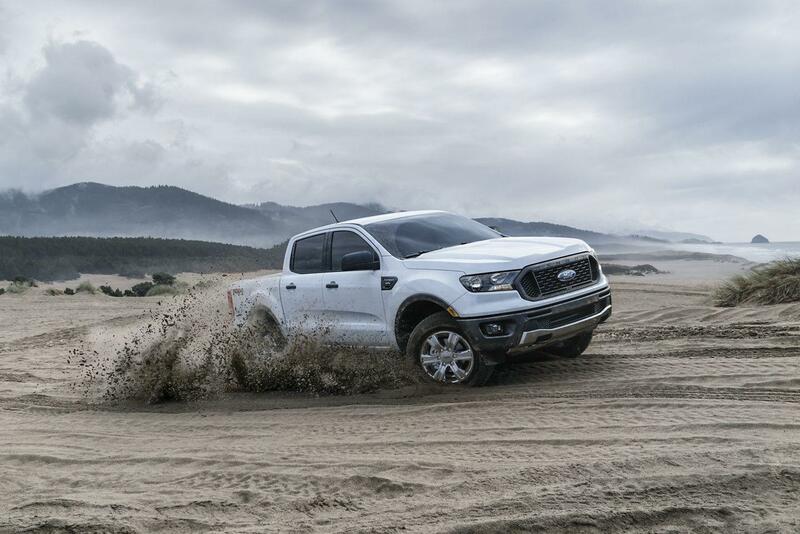 Before you buy your next midsize pickup, come into any of the Southern California Ford Dealers and let our truck experts walk you through the all-new Ranger then send you out on a test drive. We know you’ll come back impressed.